Are you tired of that old heatsink? Is your CPU overheating or are just looking for something snazzy to be placed on your motherboard? 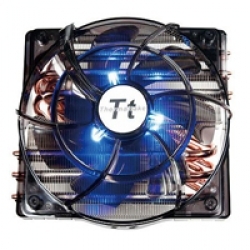 Well, maybe you should take a peak at Thermaltake’s Big Typ 14Pro. 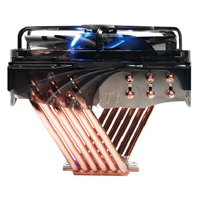 Thermaltake’s heatsinks have been winning armloads of awards for quite a few years now. If the massive 140mm fan does not get your attention, then maybe the copper heat pipes and the bright blue LED will. Lets see if the Big Type 14Pro can hold up to Thermaltake’s reputation for innovative and remarkably well working heatsinks. For those of you wondering, why the heck would they put on such a large fan? A large fan can displace the same amount of air a small fan can at a much lower speed. The lower speed generated by the 140mm fan on the Big Typ 14Pro allows for it to remain virtually silent while in operation. 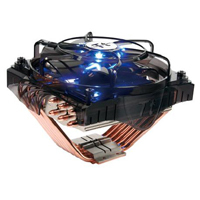 How is the heatsink mounted on Core 2 boards? Is it bolted in or does it use the plastic push-pin scheme? Thanks.